It’s been a slow news period but we are somehow already halfway through 2014, so the Mega Ultra Blast Cast runs through our personal candidates for game of the year so far on one of our shortest episodes yet. Zelda rookie Delaney has also just finished Wind Waker for the first time, so he gives us his impressions of that and more while Shane talks about Hearthstone and makes great mouth noises into the mic. The episode also features nonsensical tangents aplenty, as usual. If you feel so inclined, go for a run, take a scenic drive, jazz up your afternoon commute or just curl up on the couch and play some games while you listen to the opinions of three pensive Sydneysiders. 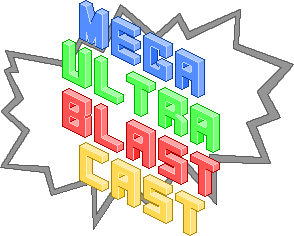 The Mega Ultra Blast Cast just celebrated its one year anniversary and that means another E3 wrap-up episode – only this one is thankfully about half as long as the first one we did in 2013! Shane, Delaney ad I still manage to talk about pretty much every single game at all five big conferences, then we break down our top five games of the show and who won our predictions (spoilers – It was me). There’s a lot to get excited about in 2015, and of course in that ridiculously packed October of this year. Enjoy! If you feel so inclined, go for a run, take a scenic drive, jazz up your afternoon commute or just curl up on the couch and play some games while you listen to the opinions of three sleep-deprived Sydneysiders. This one snuck up on me with next to no hype and that is so, so refreshing to me right now. I’m a big fan of the “time travel” sub-genre of science fiction, particularly lately. In the last half decade or so moviegoers have been treated to such quirky time travel tales as Source Code and Looper, each of which presented a cool twist on standard time travel tropes and benefitted immensely from the breathing room that comes with such an uncommonly used plot mechanic. The latest movie to join in the mind-snapping fun, Edge of Tomorrow, is better than either of them. Every other podcast seems to be doing it, so the Mega Ultra Blast Cast takes a shot at predicting the big announcements of the five big E3 press conferences! We each make two predictions per conference, with the stakes set at an all-expenses-paid dinner for the person who gets the most correct! We also pack in some in-depth discussions of Watch_Dogs, Mario Kart 8, all the pre-E3 game leaks, a debate about whether the Wii U really needs its gamepad controller and some confusion over Cher lyrics. It’s high-intensity and its only on Soundcloud. If you feel so inclined, go for a run, take a scenic drive, jazz up your afternoon commute or just curl up on the couch and play some games while you listen to the opinions of three opinionated Sydneysiders.